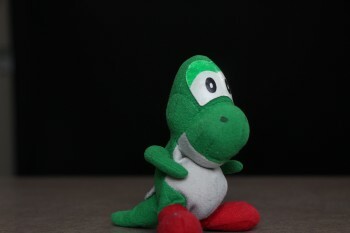 When I was much, much younger, I had a very small Yoshi (From the Mario video game universe) that was about two and a half inches tall filled with beads. It was like a Beanie Baby, I still have it as a matter of fact. It was my favorite toy ever, I took it everywhere I went. I took it outside, where I slept, in the car, to the store, anywhere that you can think of. It was the best toy ever and the reason why Yoshi is my favorite character from any video game ever (well, him and Megaman). One day when my family and I were visiting my Grandparent’s house, I unsurprisingly brought my Yoshi toy with me. I don’t know where my parents were during this time. I was just walking around the house doing my own thing when I came across a room. Inside the room was some porcelain bowl that was a bit foreign to me. Now keep in mind, this was before I was potty trained. I was, maybe two or three. I was a wee lad, don’t judge me. So I walked into the bathroom and up to this mystical white bowl. I opened up the lid and was surprised to find water in the bowl. I didn’t know what to think. I had seen this before but wondered what was its purpose. Why was there water in there? Then I noticed a lever. Curious, I decided to push the lever. To my surprise, the water started to spiral around until the level receded with little water left and then the bowl filled back up. Now, out of all of the things that could have gone through my mind, with my Yoshi in my hand, I thought of only one thing. It all made so much sense to me now, this porcelain bowl is obviously a water slide designed for small toys and other small items. I decided to place Yoshi in the bowl and pull the lever. I watched him go around and around until he disappeared through the hole at the bottom. I was so excited that I wanted to see it again so I looked under the bowl to find him, but he was no where to be found. My excitement turned into anticipation which turned into fear. I searched for Yoshi but he never came. Then, like the small baby I was, I ran around the house for my mom crying to her. I somehow managed to explain the situation to them with my toddler-level vocabulary. They went to the toilet but figured it was no use so they decided to go to the store to buy another one. I was a little kid, I wouldn’t have been able to tell the difference. So they drove around town all day to multiple stores but they couldn’t find another Yoshi toy. They came home and said they don’t know where Yoshi went. You can probably imagine the disappointment I felt. I was moping around due to the loss of my favorite toy that I considered my best friend. I thought the Yoshi toy was gone, but fate had another plan. I went back to the bathroom and decided to pull the lever on the toilet again just because. That same toilet had apparently not been used all day so no one found out that the toilet was clogged. The toilet was clogged and the water started to fill up. I would like to think I went to my mom and said, “Mommy, the potty broke,” but I don’t actually remember and I’m pretty sure I could articulate words better than potty at that point. Maybe. Probably not. So they inspected the toilet and obviously found the water starting to rise, so they got the plunger. In the plunger went as it started moving back and forth to dislodge the clogged item. Something dislodged and shot out of the toilet and landed behind it. Now unless you are daft or haven’t been following the story at all, I bet you can figure out what flew out. Guess what? It was my Yoshi! So after I got Yoshi back, we sent him through about two cycles of the washing machine for obvious sanitary reasons. To this day, I still have that same Yoshi toy and I keep it on a shelf in my room so I always remember this story. I would keep it on my bed or someplace lower but then I would have to fight my chihuahua for it, and I don’t want to lose that Yoshi toy again. It is because of this that the character Yoshi and the whole Mario game franchise has a special place in my heart. Keep on keeping on Nintendo. ← VIDEO ANNOUNCEMENTS – LAST ONE!